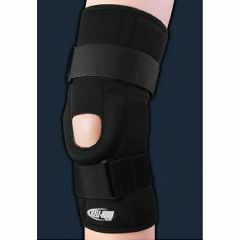 The Bell-Horn ProStyle Hinged Knee Support is designed to give you the comfort of an elastic support with the therapeutic properties of heat, without the perspiration associated with neoprene. Recommended for swollen or tender knees resulting from: sprains, strains, sports injuries or post-operative rehab. Pull up brace. device is solid. device is good but runs s.
order a size up. .
Order a size up because they run small. Hard to return. When I called, I was told they needed to contact manufacturer first. And they would contact me within 24- 48 he. We'll this was several weeks ago and I never heard from them(allegro). The brace itself is a good brace, just not true to size. But I will not be ordering anything from Allegro again. by Sue, the MD girl. from Lewistown, Pa.